“I don’t know why they kept us hostage. I kept pleading with them to let us go, but they wouldn’t listen,” said 12-year-old Aatif's uncle, who managed to escape. Hajin (Bandipora): A lively boy with a smiling face, Aatif Shafi studied in Class 6. His father, a small-time farmer, was planning to send his only son to a boarding school in nearby Manasbal, a scenic tourist spot in north Kashmir. But in the conflict-ridden Valley where many dreams have shattered, Aatif’s became another heart-wrenching tale. The 12-year-old boy was taken hostage by militants who were holed up in his house in Hajin town, a first such incident in more than a decade. Aatif’s mother requested the two militants to free her son, but they didn’t allow the young boy to walk out of the house that was the target of security forces. The family even pleaded with forces to delay the assault, hoping against hope that their son would be released. That, however, didn’t happen. Twelve hours later, Aatif’s charred body was recovered from the rubble after the gunfight ended. Both militants were killed in the encounter. Early on the morning of March 21, the forces had quietly laid siege around Mir mohalla of Hajin town in Bandipora district. Aatif’s father Mohammad Shafi Mir and his uncle Abdul Hamid Mir lived in a joint family in a three-storeyed house in the locality. All family members, eight of them, were at home where the militants, Lashkar-e-Tayabba commander Ali and his associate Hubaib, were also hiding. As the forces tightened the cordon, the militants opened fire, triggering and encounter. In the first few minutes, six members of the joint family managed to escape from the house. But Aatif and his uncle Abdul Hamid were kept hostage by the militants, according to family members. The Mir house after the gunfight. 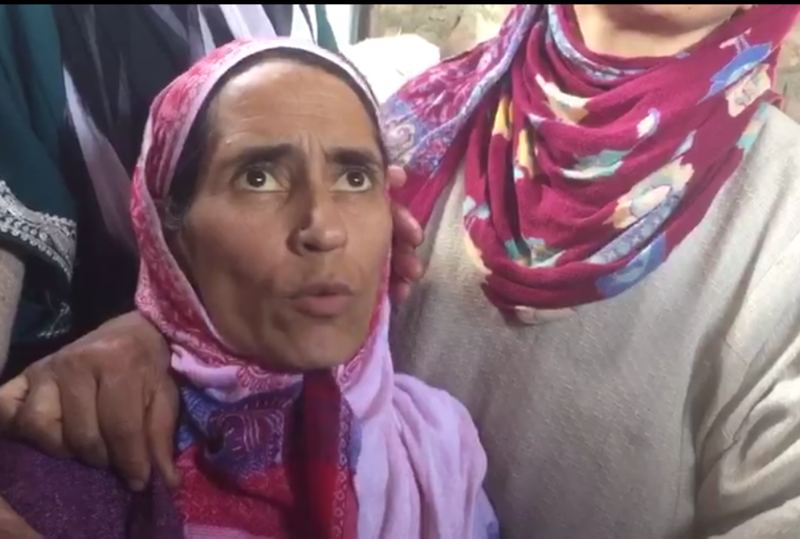 Aatif’s mother Shareef Bano said while fleeing the house at around 9:15 am, along with her two daughters, she pleaded with the militants to let her son go. “They told me he is upstairs and will come down soon,” said Bano. For the entire day, the family waited in the lane next to their house, their eyes glued to the front door of their residence. In between, they kept making fervent calls to the militants to release the uncle-nephew duo. At around 5 pm, the “unthinkable” happen. Abdul Hamid came running out of the house, in a dramatic manner, breathless, his entire body shivering. “He drank a full mug of water before he was evacuated by police,” one of his relatives recalled. On Saturday, Abdul Hamid sat motionless at a neighbour’s home, mourning the death of his nephew. Narrating his successful escape to The Wire, the man in his late 40s, with sunken face, said he and Aatif were kept on the third floor of the house by the militants. “One of them (militants) told me to shift towards the front side of the room…that is when I sensed an opportunity and finding the door open, ran down the stairs…I heard a gunshot also but I kept running,” said Hamid. “I don’t know why they kept us hostage. I kept pleading with them to let us go, but they wouldn’t listen,” Hamid said. Senior superintendent of police Bandipora Rahul Malik said they “tried their best” to rescue Aatif. “We showed lot of patience and tried different ways to rescue the hostage…we involved local Auqaf committee members who made announcements on the loudspeaker from mosques, appealing militants to release the civilian. But the militants didn’t respond,” said the SSP. Concerned about her son’s safety, Bano kept appealing to the militants to release Aatif throughout the day. “He (Aatif) is innocent. What has he done? For God’s sake please leave him. What wrong have we done to you; we fed you, please leave my son,” Bano requested the trapped militants on a microphone during the day. A video of this desperate appeal has gone viral on social media. In another video, Aatif’s grandfather made a similar plea to militants. “”This is not jihad but jahalat (ignorance). He (Aatif) is an innocent child, please leave him,” the elderly man can be heard saying in the video. Aatif’s aunt too tried to persuade the militants to release the young boy. But the family didn’t get any response from the militants. Another relative said both militants had been living in the house for the last three days. How did the boy die? According to the SSP, the holed-up militants didn’t let Aatif come out of the house. 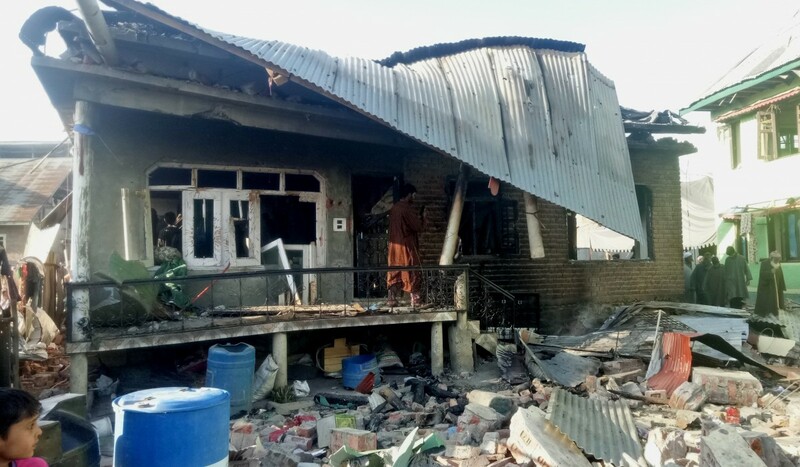 “They killed the boy before [our] forces launched the final assault,” the police officer said, adding that the forces decided to blast the house after 6 pm on March 21 “only when we were sure that the militants had killed the minor boy”. But there are many questions left unanswered. How did the police know that the boy, who was in the captivity of the militants inside the house, had been killed? “The boy’s uncle told us that Ali (the Lashkar commander) had put a long knife on the neck of the child. Then we sent Aatif’s mother to the house but she too couldn’t see the boy there,” the SSP said. “Despite repeated requests, why didn’t they release the boy? That means he had already been killed in a fit of revenge. We are sure that the boy had been killed. The militants had also fired two shots at his uncle to kill him when he was rescued… all these are circumstances. Nobody can say 100 percent anything (sic). We have to connect the dots,” said the SSP. Aatif’s mother said that after the militants didn’t release their son despite repeated requests, the family members were taken away from the spot by the security forces. “They (forces) waited for the entire day on our request. But we were not there at the time of the blast,” she said. On the morning of March 22, three charred bodies were recovered from the site. One among them was Aatif’s. The SSP said postmortem of Aatif’s body would establish the nature of injuries he had suffered and cause of his death. A source said the autopsy was conducted at Hajin police station by a group of doctors from a local hospital. “But the body had been charred beyond recognition. While the parents couldn’t muster courage to see the body of their son, his uncle could identify him only through length of the body. It had got reduced to an arm’s length,” said the source. The young boy’s funeral was held late on Friday afternoon. It was attended by hundreds of people from the town, including many young friends of Aatif’s. They cried silently as Aatif’s body was lowered into a grave. 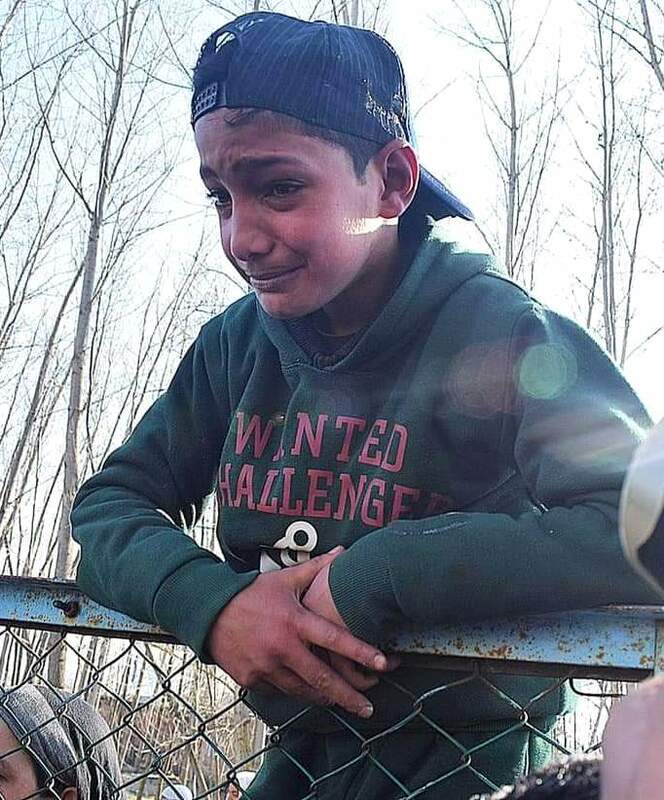 A young boy crying at Aatif’s funeral. The shocking incident has invoked strong reactions from people in the Valley. Many took to Facebook to express their anger. “…Aatif was held hostage by militants. Militants & armed forces are both responsible for this murder. Surely militants are accused of a horrible crime,” human rights activist Khuram Parvez wrote on Facebook. Political commentator Gowhar Geelani termed “deplorable the use of minor, Aatif, as human shield”. “Unacceptable to use minor, Atif, as a human shield. Criminal to say the least. Horrible crime. Holding civilians, majors or minors, hostage is not on. Deplorable,” Geelani wrote. On the streets of Hajin, the town with a chequered past located on banks of Jhelum, people are yet to come to terms with the incident. There is anger against the use of the minor as a human shield. But this anger is expressed in whispers and in words measured cautiously. 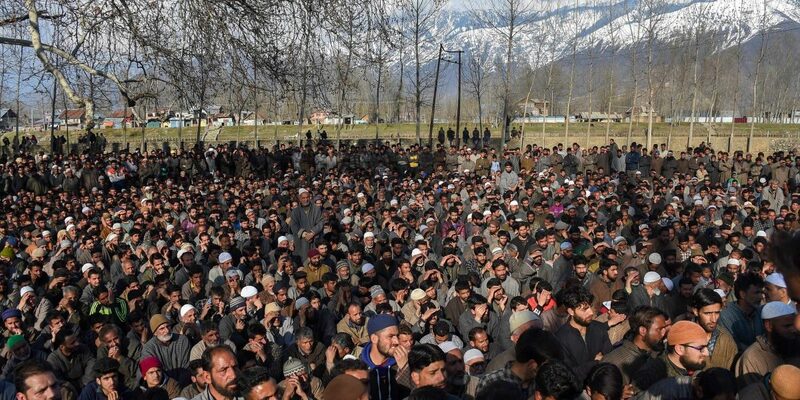 “They (militants) knew that their death was imminent, but they could have freed the boy…they chose not to,” said an elderly man from nearby the Parray Mohalla who visited the family on Saturday morning. For a burly youth, who identified himself by his first name Muzaffar, the militants’ act was “unpardonable”. “Who will have thought that we will have to see this?” he asked, before disappearing into a nearby lane. Note: The story was updated at 1830 on March 24 with additional details from the SSP about the circumstances in which Aatif is believed to have died.